Known as Exciting Basket in Japan, Double Dribble introduced a whole generation of video gamers to that sweet, sweet dunk animation and the iconic “Double Dribble” voice emulation as the game opens. 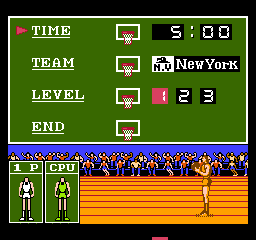 Made by Konami before they went all sorts of corporate crazy, Double Dribble was actually the company’s second attempt at basketball following the much less popular Super Basketball. It does have the distinction of being the first video game to feature The Star-Spangled Banner, prompting exactly zero people ever to stand and cross their heart as the 8-bit national anthem ushered players into the game. In fact, as the national anthem plays it shows either a mass of people heading to the most exciting basketball game of all time, or a slow gray lava flow inching toward an odd looking purple domed stadium. Where was the parking to begin with? Also, I need to address the title of the game. A double dribble in basketball is a foul resulting in a turn over of possession. Furthermore, having not played the game in a while, I’m not entirely convinced you can commit said foul in the game. The selection screen was always really cool. A nondescript player shoots a ball at a four possible baskets. As you select a team he makes a basket indicating the change. You can also choose from 1 of 3 difficulty levels and adjust the time according to the length of play you desire. The weirdest aspect of this screen is in the bottom left where you see two images of players. One is a representative of you the player and the other shows the computer. The rendering of a human is pretty far fetched, even for the 8-bit graphics as neither has a face, knees, or anything resembling an anatomically correct body. Kind of creepy. The sounds associated with the different actions of the game are almost accurate, though it does sound like a cannon blast anytime a basket is made. Of course this may be made altogether worse by the Doppler-like sound given to the ball as it arcs through the air giving it that unmistakable sound of a missile en route to its target. The dribble sound is a nice rhythmic thump, thump, thump throughout the entire game and can be a little headache inducing if you focus on it too much. But again, this is an early 8-bit game with limited graphics and sound options, so it did a fine job for the time. At the end of the game we’re given an animated shot of one of the players, presumably the MVP of the game, pumping his fist and waving around what looks to be Chairman Mao’s little red book. He’s wearing a medal for some reason and raising his hands in celebration while his adoring fans sit silently in the background. It’s all a bit frightening. I poke a little fun at the game in this article but let me finish my critique by saying, I’ve put hours upon hours into this game. My friends and I held tournaments all the time forcing me to admit that this is easily in my top 100 NES games of all time. The game play is solid. The mechanics of the game are spot on. The sounds and colors put you right into the arena of a basketball game and it does all of this via the limitations of the NES. All in all this is a solid game and its no wonder its still one of those nostalgic games most gamers recall from their youth. One final thing. If you want to play Double Dribble but don’t have access to an original NES, fear not. Just get out your trusty iPhone, go to the app store, and for a little bit of money you can get the mobile version of the original game at your fingertips. Happy Gaming! ← The Definitive Top 100 NES Games of all Time!! !